Sporting art of the late 19th century was strongly influenced by the invention of photography. The talbotype changed the standards of realism and records of races and other sporting events could be easily made. Horses could now be caught in mid jump or crossing the finish line. By imposing these new standards, photography in some ways stifled the naiveté, exuberance and humor of sporting art of the previous two hundred years. 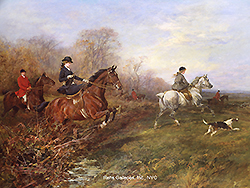 Artists like Heywood Hardy and his contemporaries strove to preserve the tradition of sporting art. They painted pictures of horses and hounds which were both competent and pleasing and their many patrons continued to be delighted by their work. It seemed that although photography was more expedient and accurate for the purpose of capturing and image, it could not replace a beautifully painted portrait. Hardy was a painter of horses and game, as well as a genre painter and etcher. He was born in London in 1842 and spent most of his life in East Preston and Bristol, where he became famous for his sporting scenes. His formal training began in London and was continued in studios in Antwerp and Paris. Hardy began exhibiting in 1861 and continued showing works throughout his long career. In all he presented 31 works at the Royal Academy; 9 at the British Institute; 16 at Suffolk Street; 7 at the Old Watercolour Society; and additional works at both the Grosvenor and New Galleries.